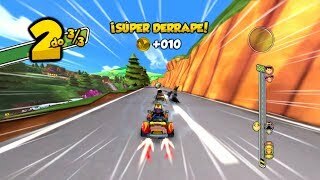 El Chavo Kart includes almost all the characters of the El Chavo animated series' go-kart driving in places presented in the same. The game offers ten circuits and twelve characters. There are three game modes: Cups, Exhibition, and Challenges. In the "Cups" mode, the player can unlock characters, while at the end of "Challenges" scenarios and tracks are unlocked. The player can collect power-ups along the race which can be used to benefit himself and gain an advantage in the race. Tracks include series features and scenarios such as Azteca Stadium, the city of Acapulco and also the Maracana Stadium in Rio de Janeiro. Each track can be walked in the opposite direction. Tracks include alternative paths, traps and obstacles.